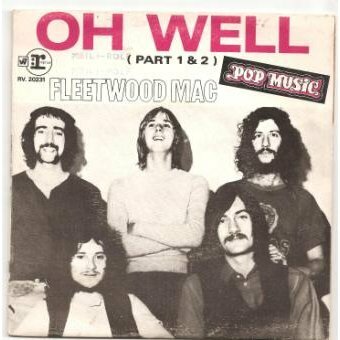 At number 22 in BBC Radio 2’s list of the 100 greatest guitar riffs is “Oh Well” by Fleetwood Mac. Although I’m a fan of Fleetwood Mac, I had never heard this song before. It is from 1969 and was recorded when Fleetwood Mac had its original lineup with Peter Green as lead singer and lead guitarist, it is he also who wrote this song. I don’t know any Fleetwood Mac songs before Christie McVie, Lindsey Buckingham and Stevie Nicks joined, so the material with the original lineup is completely unknown to me. After saying that, when I heard the opening 10 or so seconds of the song I recognised it straight away. I did not know it was a Fleetwood Mac song, but the opening 30 or so seconds was used at the end of each episode of a BBC Radio 1 documentary called “25 Years of Rock” that was broadcast back in about 1978 or 1979 and which I recorded on cassette tape. I only recorded the episodes from 1964 to 1971, and have only been able to find the cassettes with the 1964 to 1969 episodes, but I have recently transferred these to MP3 files so that I can listen to them on the move. I will say more about that fascinating series in a future blog, but here are the lyrics of “Oh Well”. Here is a video of this interesting song. Enjoy! At number 29 in Rolling Stone Magazine’s 500 greatest songs of all time is “Help” by The Beatles. This John Lennon written song was recorded in 1965, and is the title song of their 5th album, released between “Beatles for Sale” and “Rubber Soul”. There is also a 1965 film by the same name, starring The Beatles in a mad-cap caper in London and the Bahamas. 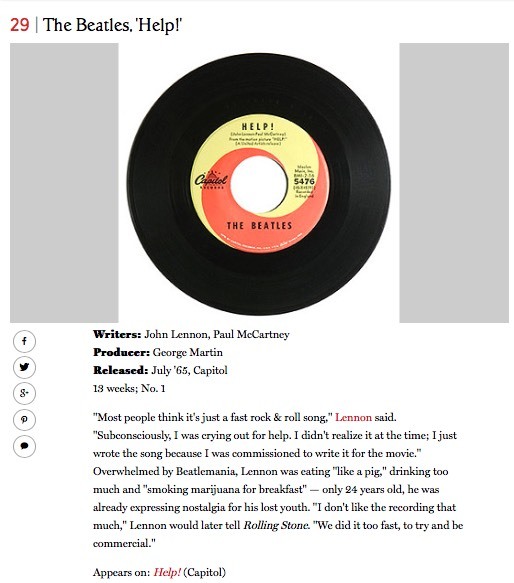 Lennon wrote this song in what he later described as his “fat Elvis period”, saying that it was indeed a cry for help as he was suffering at the time from depression. At number 29 in Rolling Stone Magazine’s ‘500 Greatest Songs of all Time’ is “Help” by The Beatles. Here is a video of this song, with some clips from the movie. Enjoy! In this blog here, I derived the expression for the volume of a sphere, using spherical polar coordinates. There is, however, another way to do it which some people may find easier, and that is to use something called the volume of rotation. 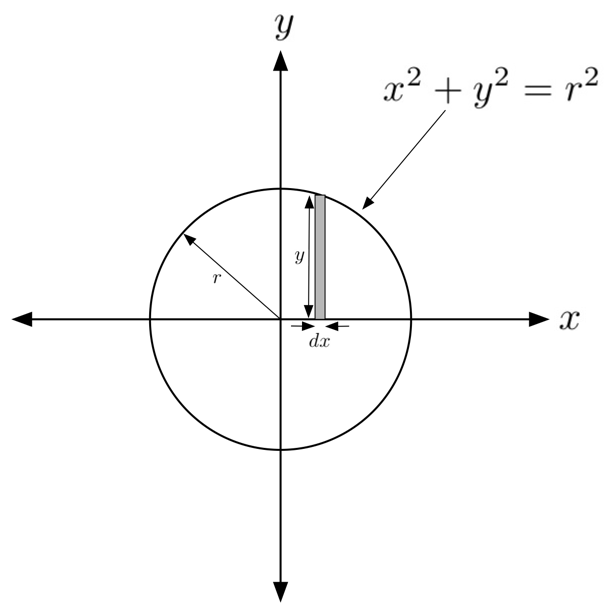 Remember, a circle with radius which is centred on the origin has the equation , but as I pointed out in my blog on deriving the area of a circle, because we can’t integrate we are stuck in trying to use conventional Cartesian coordinates, which is why we had to use polar coordinates instead. However, if you are not comfortable with spherical polar coordinates to derive the volume of a sphere, there is a trick to get around using them. That is to use the volume of revolution. The idea is quite simple, imagine the strip which has area as shown below. 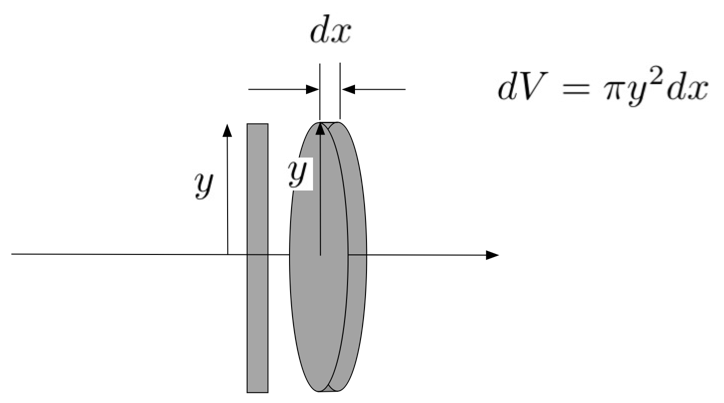 Now, imagine rotating this trip about the x-axis, to produce a disk as shown in the figure below. The surface area of this disk is just the area of a circle with radius , and so its area . The volume element of the disk is then just , but as we can write this becomes , which is easy to integrate. just as we had before. QED! With the score at 15-13 to New Zealand, Welsh full-back Leigh Halfpenny slotted a penalty goal to put Wales 16-15 up, with just 13 minutes left of the match. Welsh fans dared to dream that we could beat NZ for the first time since 1953. Then, with only 11 minutes to go, NZ scored an opportunistic try, and by the time the match had ended they had stretched their lead to a 34-16 win, scoring 19 unanswered points in the last 11 minutes. What heartbreak for Wales; but hats off to New Zealand, this is why they are the best in the World. This was a nail-biting match, with not an inch given by either side. After a thrilling first half, the score stood at 3-3; in stark contrast to the high scores one sees more and more in rugby these days. Wales had been under pressure for most of the first half, but the Welsh defence was immense. The lacklustre display against Fiji from a week ago was replaced by a level of commitment which was enthralling. Time after time the Welsh players put in the most crunching tackles on their opposition, and New Zealand could not find a way through despite all the possession and territory they were getting. Early in the second half the try-deadlock was broken, with New Zealand scoring a try from a nice break to the left. Wales fly half Dan Biggar missed a tackle which he really should have nailed, and New Zealand were over. After converting the try they were 10-3 up; but Wales struck back within a few minutes with a lovely try by Rhys Webb, to level the scores at 10-10. Then, Wales were awarded a penalty to go 13-10 in the lead, before New Zealand struck back with another try, which they failed to convert. It was 15-13 to New Zealand before Halfpenny slotted the penalty on 67 minutes to put Wales into the narrowest of leads. The try on 69 minutes which put NZ back in front was cruel on Wales, the All Black outside half Beauden Barrett chipped ahead and the awkward bounce caught Halfpenny going in the wrong direction, and the Kiwi was in under the posts. A few minutes later Mike Phillips had a clearance kick charged down and all of a sudden Wales were 29-16 behind, when only 5 minutes before they had been 16-15 up. Another unconverted try for NZ in the last few minutes left a final score of 34-16, but the scoreline didn’t indicate what a tight match it had been until the last 10 minutes. So, heartbreak once again for Wales, and it is now 61 years and counting since we last beat New Zealand. It is difficult to see what else Wales could have done, they put in a huge effort but were undone in the last 10 minutes by a better team. NZ have the ability to absorb pressure, and then just move up another gear at the business end of the second half, and this is what they did on Saturday. In my opinion, Wales’ play didn’t significantly worsen in those last 10 minutes, although some substitutions did disrupt things. But, for me, it was more that NZ just applied that killer instinct that they have and moved to a level of play that was too good for Wales. We now have to pick ourselves up for our final game of this Autumn series – the Springboks next Saturday. If Wales can put in a display like we did against NZ, and go into the last 10 minutes with a larger lead, I don’t see any reason why we cannot record our second ever victory over South Africa. We shall see! 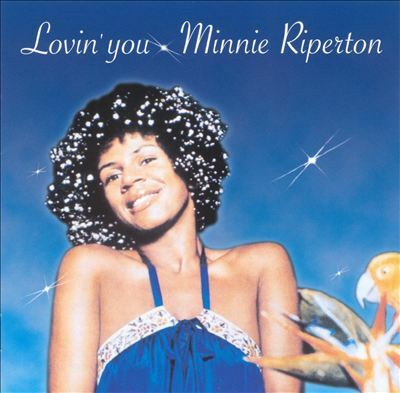 Today I thought I would share this song by Minnie Riperton – ‘Loving You’. I remember this song very vividly from my childhood, it was released in January 1975, and it is my understanding that it has one of the highest notes ever recorded on a pop song. It reached number 2 in the Disunited Kingdom, and number 1 in the US. And here is a YouTube video of her performing the song (I’m not sure why she has a bush growing out of the side of her head, but this was the 1970s! 😛 ). Enjoy! Birth of a new Saturn moon? This story caught my attention back in April, the possible creation of a new Saturn moon on the outskirts of its famous ring system (I’m not sure why it has taken me so long to blog about it, probably because in April I was working frantically finishing up my book on the Cosmic Microwave Background). 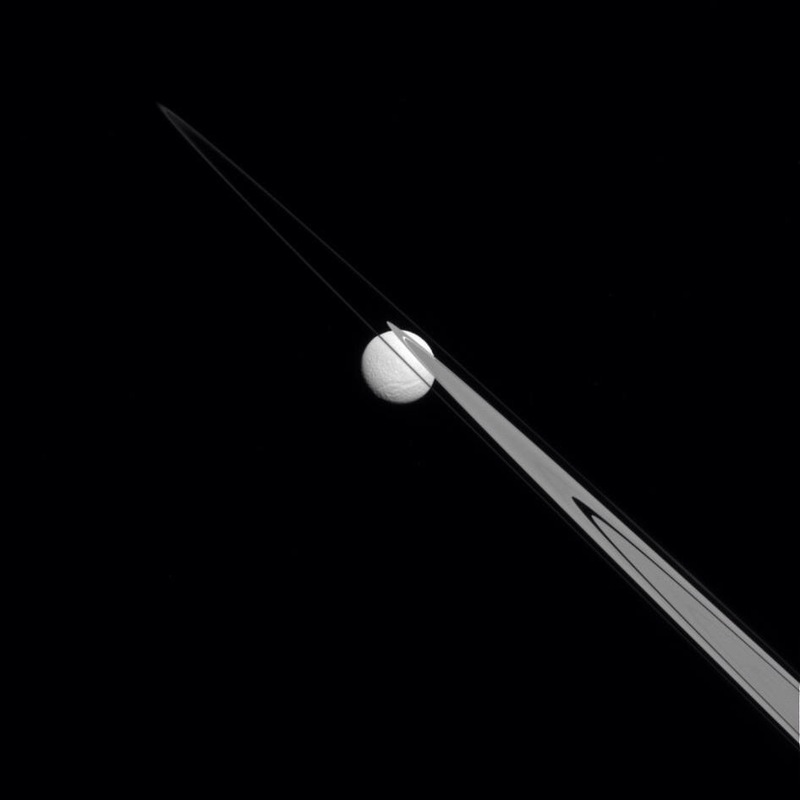 The particles in Saturn’s rings are basically small lumps of rocky water-ice, and so are pretty good at sticking together if they collide. What we think is happening is that this little moon is being created by the collisions of the particles in the ring system, which is slowly building up a new moon. Quite spectacular really, to see the possible birth of a new moon! A story about the birth of a “new” moon about Saturn. We don’t fully know the origin of Saturn’s rings, there are two competing theories. One is that a larger moon which would have formed at the same time as Saturn (i.e. 4.6 billion years ago) and at some time in the past came too close to Saturn and was torn apart by Saturn’s gravitational tidal forces. The point at which an extended body will be torn apart by tidal forces is called the Roche limit, and once an object is closer than this the gravitational forces on e.g. the near and the far side are too different and the object gets torn apart. The size of Roche limit depends on the planet (so would be different for the Earth and Saturn), but also on the size of the object. So, the Roche limit for a larger moon will be different (at a larger distance) than for a smaller object. The other theory is that they formed from debris left over from Saturn’s formation, just as the asteroid belt is debris left over from the formation of the Solar System. 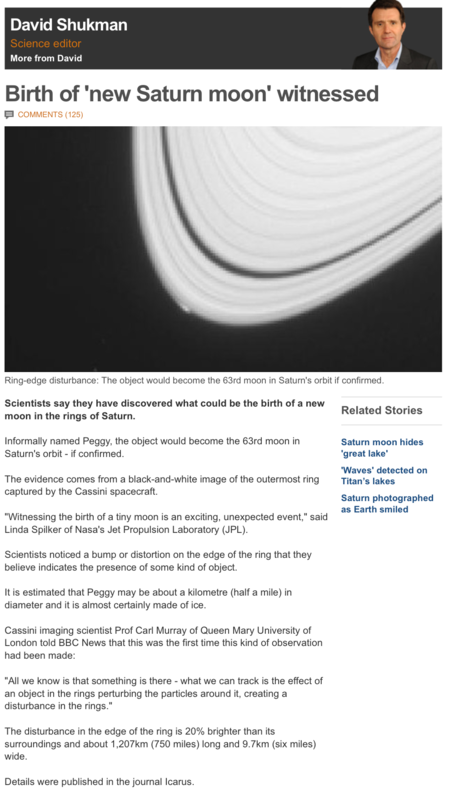 The problem with this theory is that the rings are thought to be just a few hundred million years old, whereas if they are left over debris we would expect them to be as old as Saturn. As of writing this, we are not sure which of these two competing theories is correct. Or, maybe there is another explanation entirely! Galileo looked at Saturn through his telescope back in 1610, but was not able to make out the rings as such. He saw that Saturn had what looked like “ears”, but it was the Dutch astronomer Christian Huygens who was the first to describe them as rings. They are a complex system, and it would take several blogs to describe them, but suffice it to say that in the time that we have been sending space probes past or to Saturn (e.g. Voyager, Pioneer, and now Cassini), we have been learning more and more about how complex a system the rings are. Saturn is not the only planet with a ring system, it may surprise you to hear that Jupiter, Uranus and Neptune also have ring systems, but none is as spectacular as Saturn’s. Here is an amazing photograph taken by Cassini of Saturn and her ring system, looking back towards the Sun. It also shows several of Saturn’s moons, Mars, Venus and even the Earth!! This amazing photograph, taken by NASA’s Cassini space probe, shows the rings back-lit by the Sun. The photograph also shows Mars, Venus and the Earth! The Cassini probe has been an overwhelming success. Launched in 1997, it arrived at Saturn in 2004, and some of you may remember it sent a little probe called Huygens which landed on the surface of Titan in January 2005. For the last ten years it has been orbiting Saturn and some of its moons, and has made numerous discoveries in doing so. 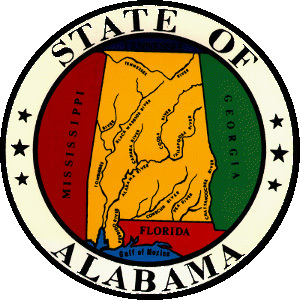 It is scheduled to remain in operation until 2017. Here are some remarkable images from the probe, together with a model of Enceladus based on the observations that Cassini has made of it. 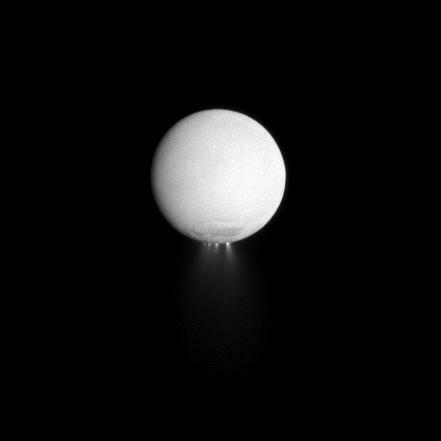 A Cassini image of Enceladus, showing plumes of water coming from its pole. One of the surprises of the Cassini mission has been the moon Enceladus, which shows geysers of water shooting out from its poles. 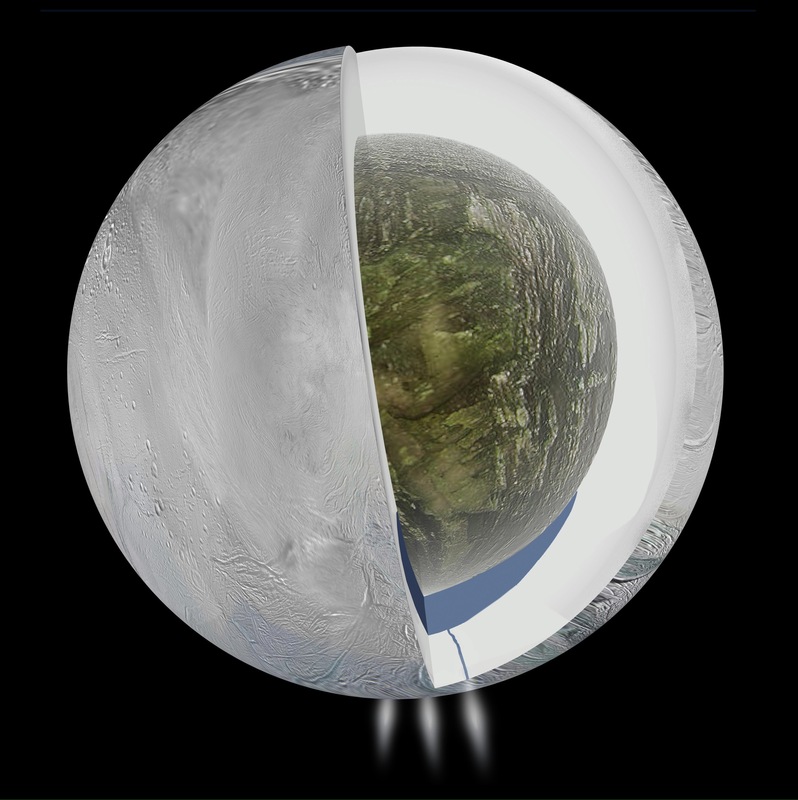 Because of the presence of water, Enceladus has become a prime candidate to look for life beyond our Earth. A Cassini image showing the rings nearly edge-on, with the moon Dione in the background.